Easy 640 to 700 GMAT? Another "big box test prep" graduate called the other day - he couldn’t crack the GMAT 700’s. Why? Good question. Adam was whip smart and especially talented at verbal. I wouldn’t call him a Quant nerd but after a bit of training he could slice through 95% of the GMAT Official Guide. If I had to complain I'd say that because he was extremely busy and stressed out with work he couldn't commit 100% to the GMAT tutoring program. That’s not to say that the homework results were bad but just not perfect. He was always struggling just a bit with his cup overflowing with responsibility. Oh, and he also had two young kids. He wanted to improve from a GMAT 640 to 700 in 8 weeks, a reasonable goal for a smart, hardworking guy. We were hopeful as GMAT day loomed on the horizon. But, the 700 twas not to be. 660. He had been logging Quant scores in the high 40’s but had crumpled to a 41 on GMAT day. We had a quick debrief to diagnose the unexpected results. Verdict: exhaustion. He'd studied 10 hours per day the two days before the exam. Holy crap! I would never have someone study that much - ever (especially right before a test). It completely burned him out. Here are some suggestions for the last week of GMAT studying. A month later: 640. Right back to where we started. Somewhere in the middle of the Quant he had started to panic and from then on had triple checked every answer. After that the test had spun out of control. Adam left seven questions on the Quant and twelve questions on the Verbal blank! It's one thing to be thorough but another to be paranoid. At some point you have to let go. Start practicing this on your HW sets and of course on your practice tests so that you have a handle on it for GMAT day. I advised another retake without additional tutoring. I just provided a study schedule and materials. He didn't need to learning anything new. He really didn't need more studying. The focus was on trying to relax. Trying to just feel positive while working on GMAT questions. Trying to study less. To put less pressure on. Then came test day. 640 to 700? Dunno. No phone call or email. Ugh. It always feels strange and unsettling to be in the dark. I always think the worst. I sent over a quick note to check in: no reply. Hmmm. Fast forward two months. An email! The test had not gone well. Another 640 GMAT. Good news though: he had gotten into Kellogg! Hurray!!! Still he wanted to improve his chances at Harvard, Stanford, and Wharton so he gave the GMAT one last shot. No studying at all: 700! There’s no magic formula for transferring the knowledge required to achieve a glittering GMAT score. What do you need to gain mastery over the breadth of content and types of reasoning the GMAT will demand? Consistent presence of mind in the seconds, minutes, and hours over days, weeks, and months of GMAT preparation. In our consultation I discussed this idea with Sara. It clicked with her. And by the end of our 11 weeks of GMAT prep she improved her GMAT score from a 630 to a 720. Sara came in the door with a GMAT breakdown we see pretty often: great verbal, iffy quant. She started off with a 630 (q36 v40). The quant was only in the 36th percentile, but, the good news, the verbal was in the 90th. If you had to choose, this is a great split, as GMAT quant is easier to improve than verbal. Also, a 40+ verbal score indicates some pretty solid reasoning skills, which, given the right direction and structure, should help you shine on the quant as well. When it came to our tutoring sessions, it was ever clear that Sara was ready to hit the ground running. In the pre-tutoring phase she had put in the legwork to make the quant fundamentals second nature, so, when I introduced new concepts, she wasn’t struggling on the basics but was instead ready to go with the more challenging part of the GMAT: the critical thinking. Although we manage homework 100%, even review, Sara let me know that she was doing additional review, even redoing entire sets if she’d scored below 50%. From Day 1, she committed to mastering every new concept that I threw her way. She wasn’t going to let anything slide. No dusty corners here! Nor was she going to go easy on verbal just because it was her strong suit (a big GMAT studying mistake). No matter how many ferocious LSAT Critical Reasoning quizzes I assigned, she applied that same dedication trying to get as close to a perfect score as possible on each and every one. 11 weeks is a hefty amount of time to stay consistent with daily GMAT practice. It’s even tougher to keep a positive, motivated mindset, especially when learning and subsequent score increases come in fits and starts. What served Sara well in this regard was her perseverance to making daily GMAT practice a habit right out of the gate. Because of her dedication she started improving quickly. That improvement motivated her to keep up the effort, and, as a result, our sessions became more dialogue than lesson as she pushed the pace of the preparation. Could it be a GMAT 720 only 4 weeks in? Sara’s situation was somewhat unique in that she had already booked a test date prior to our starting the GMAT tutoring process. That test date fell at the halfway point of our sessions. 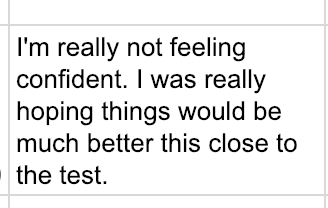 I encouraged her to keep it booked but to take it as a no-stress practice test. But, as that day grew closer there emerged a strong possibility she’d hit a 700. She may very well have done so on any other day, but chaos reigned at the test center. A neighboring computer malfunctioned and her testing area was packed with IT techs through most of her quant section. She walked out with a 660. Certainly not the score she deserved but still an improvement over the 630, even in the midst of GMAT test center incompetence. Sara wasn’t deterred. The opposite, in fact. Having stared down the GMAT and walked away relatively unscathed renewed her determination to hit 700 and potentially beyond. She doubled down her efforts over the next few weeks, scoring in the 90+% range on most homework assignments. She brought any uncertain concepts to sessions, leaving no stone unturned. On her next GMAT practice test, she scored a 700, and we intensively reviewed every quant question she had missed. Smarts, hard work, and a great attitude lead to the inevitable: GMAT 720! Then, on test day, 720. I wasn’t surprised in the slightest but was unbelievably excited for Sara. This was, beyond a doubt, a 720 very well-earned. 100 point GMAT improvements in the higher score ranges are challenging. But with a can-do attitude from the start and an unfailing commitment to staying ahead of the game, an abstract possibility like this GMAT score increase from 630 to 720 can become almost inevitable. GMAT percentile scores change year to year. In 2019 a 720 GMAT score is in the 94th percentile. Here's an in depth discussion on GMAT percentiles along with some analysis on why a failing GMAT quant score is OK in 2019. A 720 on the GMAT 100% satisfies the question that you've got the skills to succeed at any MBA program on the planet. That said, as crazy as it sounds, even though a GMAT 720 is in the 94th percentile, in 2019 you'd still be below the median at 10 top business schools. Does that mean if you're gunning for Harvard, Stanford, Wharton, and crew that a 720 GMAT isn't good enough? No. Absolutely not. A 720 GMAT score might be all you need. It's a great score. If you're considering a retake you might talk to an admissions person first so that they can weigh your entire application. It might make more sense to work on the rest of the package instead of the 10-20 points that would push your GMAT score at or above the median of your dream MBA program. Still, if you're gung-ho and want to improve that 720: go for it. There's probably more gas in the tank if you're willing to put in the work. GMAT Focus Quizzes - these are 24 question/45 minute computer adaptive quant quizzes based on official GMAT questions. You can buy four of them from mba.com. They are great for the end of your GMAT prep or for a retake. Nice and tough. I always feel like GMAT focus feels just like the real GMAT. Here is our GMAT Focus review. Atlantic GMAT Quant Review Quizzes - there are 12 question/24 minute quant quizzes that I developed based on my experience taking 7 official GMATs. They cover concepts that I've noticed on the real test that are unrepresented or underrepresented in the official GMAT materials. 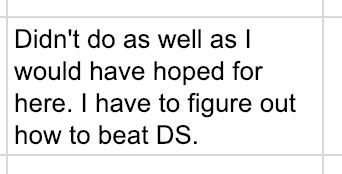 These are not official questions but I worked extremely hard to make them fit content and style-wise. These are very tough but no tougher than the toughest GMAT questions you would get on a real test. Best of all each question has an in depth explanation video so there are tons of GMAT tips and tricks. At the moment we're offering these for free for two weeks access. GMAT Focus and AG Quant Review Quizzes work really well together. Use the Focus quizzes when you have more time (on the weekends or occasional weekday) and fill in the gaps with the review quizzes. Between the two you'll have a stellar 2-3 weeks of quant preparation. Abby came in with a middle of the road GMAT 550 struggling with a 29 (12th percentile) on the quant section. The bright spot, a 40 on the verbal (90th percentile). 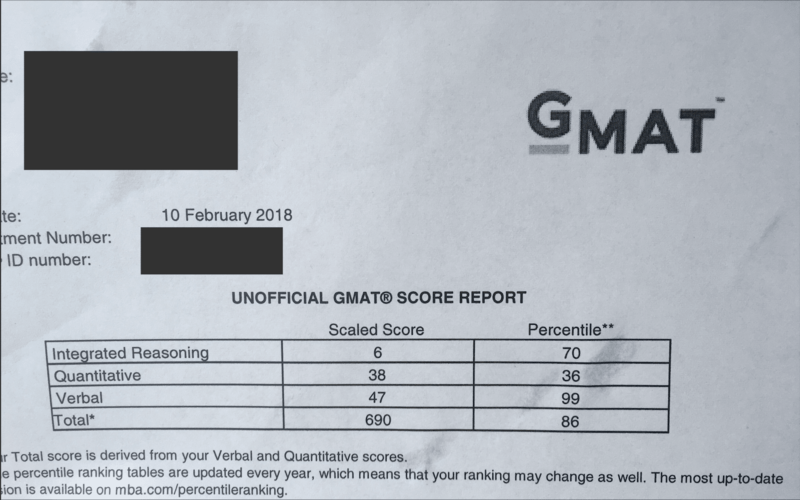 gave us hope, and we needed some, because along with most of the other people we tutor, she wanted a 700+ GMAT score, a sizable 160 points away. In Abby’s case we had a favorable split (strong verbal/weak quant) for making a big leap. Strong reading and critical reasoning skills take time to learn and are important on the quant side as well. So if verbal is already strong that's a big plus. Abby also came off as a hard worker ready to get in the grind. Ultimately she'd make a rare 200 point GMAT improvement from a GMAT 550 to 750. It had been almost a decade since she had set her mind to mathematics so naturally Abby was a bit stressed about the quant side of the GMAT. That stress faded once we started our tutoring sessions as it became clear that although she was missing a ton of fundamental math knowledge Abby was fine juggling numbers and fantastic at applying new GMAT strategies. Considering the homework scores she was putting up on her GMAT schedule it was easy to forget that Abby's initial GMAT quant score lurked in the 12th percentile. On the verbal side we buzzed through some "greatest hits" sentence correction to cover often repeated SC structural issues, but, for the most part, I just managed her SC HW. I also assigned LSAT for GMAT to get the already excellent verbal into the stratosphere. If you’re already great at verbal get better! Pushing a 90th% score to a 95th% or a 99th% can make a massive difference in your composite score. She was highly motivated and diligent. Never missing a HW assignment, doing thorough review, and always armed with tough questions during our tutoring sessions. 3 weeks into tutoring Abby launched into her first practice test and pulled out a 680 with a 40 on the quant! 130 points overall and 11 points on the quant were astonishing improvements. It wasn’t a fluke though. Abby was all in on the preparation and in the zone. 2nd GMAT practice test: Another 680. The quant had deflated to a 39. It happens. She had mismanaged her time and so had guessed on the last ten quant questions. I wasn’t worried. Practice test 3: 710 q44 v44. Practice test 4: 750 with a quant 48. She was on fire! 550 to 750 in 6 weeks. Practice test 5: 700 q42 v43. Practice test 6 710 q46 v42. The quant was a bit up and down but still the practice tests were looking good for 700+. Still, we always aim for two tests so no pressure Abby! GMAT Day: 610, q35 v42. Glad we planned for two. It’s one thing to score 750 on a practice test but it’s another thing to bring that 750 score home on an official exam. It’s not that the practice tests aren’t the same as the real thing. They are. It’s just that we don't perform the same way every day. A lot of what we do in tutoring isn’t necessarily raising the ceiling of someone’s score possibilities but raising the floor to get students really consistent even on bad days. Abby didn’t need more tutoring but wanted to schedule a few QA sessions to address any potential HW issues. In addition I made her a re-take schedule. As expected she kicked it in the teeth and continued to put up astounding numbers. I ran her through a set of extra tough official GMAT quant questions and a special set of quizzes that I call the “GMAT Quant Review Quizzes”. They are a big exception to our GMAT tutoring program in that they’re not official GMAT questions but ones that I wrote based on my experience having taken 8 GMATs. All that tough quant work got her in championship form. She was ready to rock. GMAT part 2: 720 q45 v44. She was thrilled and in a great position to apply to any MBA program on the planet. Wait this post isn't over? Nope. A couple of months later my inbox lit up with an email from Abby: she wanted to improve the 720 to a 750! A 720 is a phenomenal GMAT score and not an auto-retake. As of 2019 it’s above the median for a great majority MBA programs and just a shade below the rest. A 720 is also not an easy GMAT score to improve. The higher your score the tougher it becomes to better. That said, an admissions officer from Abby’s dream school had mentioned that improving the 720 could help her chances. Considering her practice test scores, her ability, and her amazing attitude I also felt the 720 was worth a retake. Since she hadn’t touched the GMAT in months we revisited the LSAT for GMAT work to get her critical thinking sharp again. Then we did a lot of application on the quant, retaking the GMAT prep tests (quant only), getting through the question pack 1, and, once again, the review quizzes. Her practice test scores were excellent peaking at a 740. Was she going to increase her score from a GMAT 550 to 750? Test day: GMAT 750! The quant stayed flat at a 45 but she earned a 48 on the verbal, well into the 99th percentile. It really shows how powerful the verbal side of things can be especially if you're eyeing mid-700 GMAT score. In this case it got her an extra 30 points! And that was likely just answering 2-3 more verbal questions correctly. At some point on the verbal side it’s just a matter of how much work you’re willing to do to eliminate all careless mistakes. Getting from a GMAT 550 to 750 is an astonishing feat. But given Abby's natural ability and ridiculous work ethic I wasn't surprised at her achievement. She gave a 99th percentile effort so hitting a 750 score, in the 98th percentile, was even a little bit of an underperformance. As of 2019 a 750 GMAT score is in the 98th percentile. Keep in mind that GMAT percentiles change every year so come 2020 the GMAT 750 percentile may be different. Is there a GMAT 750 Strategy? Although getting a bit long in the tooth (based on the Official guide 13th edition) our GMAT study schedule will give you a sense for the type of work you may need to put in to achieve a 750 GMAT score. That said, your GMAT plan should be informed by your specific profile. How to improve GMAT score by 200 points? Increasing your GMAT score by 200 points is incredibly difficult and very few people will have the combination of talent, attitude, and perseverance to make it happen. That said, it is possible. The GMAT debrief above is a great example. In earning a Harvard GMAT score Thomas also improved over 200 points from a 510 to 720. And lastly, I improved my GMAT score by 200 points from a 580 to a 780. What factors make a 200 point increase more possible? Score breakdown tilted heavily to verbal. Generally the more asymmetrical the better. Low starting score. The lower the score the easier it will be to climb those 200 points. From 400 to 600 is generally much easier than 550 to 750 or the near impossible 600 to 800. Having plenty of time to approach the preparation in stages. Here's the newest addition to our standardized test comparisons: GRE vs LSAT (the generalist vs the verbal assassin). Why bother with GRE vs LSAT? The LSAT has nothing to do with the GRE! Or does it? Ivy league law schools now accept the GRE, along with the GMAT and the LSAT for law school admission. Yep, it's a whole new world out there. And to add to this standardized test fever dream we've got: digital LSAT (LSAT administered on a computer). So now all the major players have ditched paper. Agree, disagree? Comment with any thoughts or questions! -The GRE allows to you apply not only to Law school but a range of other masters programs. It is the default masters school test. -For Law school the LSAT is your best option. # of test takers? 559,254 (2016). Only a tiny % for Law. 62,931 (2018). All for law school. What does it test? Verbal and quantitative reasoning skills. Verbal and Analytical reasoning skills. # of times per year 5 times per rolling 12 months. 21 day gap between test. Unlimited per lifetime. Unlimited retakes. However, the LSAT is only offered 9 times per year on fixed dates. -Quantitative Comparison LSAT has no math. The GRE has no composite score. An overall score determined by combing all subsections. 0-180. Score Reporting LSAC Credential Assembly Services (CAS) charges a one time fee of $195 to report your LSAT scores to as many schools as you like. GRE score select allows you to report any or all GRE scores. No fees apply. However, Law Schools have requested that ALL GRE scores be submitted. Rescheduling Must be done at least 4 days in advance. $50 fee. $125. Must be done two weeks out from your test give or take a day or two (LSAT has specific cut off dates that change with the test administration). Cancelling Must be done at least 4 days in advance. 50% refund ($102.50). Refund: $50 (out of $190). Must be done two weeks (give or take a day or two. LSAT has specific cut off dates that change with the test administration). Which is harder? All things equal: the LSAT is more difficult than the GRE. Easier to study for? There is comparatively little official GRE study material to practice on. The LSAT is the tougher test but it is the easier to test to study for. Why? Tons of official LSAT practice questions available. Tell me which test to take!!!!!! -Take the GRE if you have a great academic profile and really special application that would make it so a school was looking for a way to admit you even with lower test scores. The GRE doesn't factor into law school rankings. -And: are you applying to other masters programs besides Law School? You may need to take the GRE. Want to gold plate your app with the reigning monarch of Law school admissions tests? Take the LSAT. "It is advisable for students who want to maximize their chances for admission to take the LSAT." GRE vs LSAT score for top Law Schools LSAT Range for Top 10 is 163 to 175. Corresponding GRE scores below. GRE V170 Q163 For top 10 Law schools the LSAT range in 2016 was from 163 to 175. Now that the LSAT has moved into the modern age with a computer delivered exam, the LSAT and GRE have similar test structures. They're computer tests but behave as classic paper tests. You're not "locked in" after confirming an answer as you are on the GMAT. On the GRE and LSAT you can skip questions and go back to them. The GRE is slightly adaptive but not by question. So while you're working on a section there's no adaptivity. If you do well on an entire section then the next section will be tougher (vice versa if you don't do well on a section). Starting in July 2019 the LSAT will be administered 9 times a year. That's it? Yep. If you have a bad day guess what? You have to wait about 5 weeks to retake. That's far better than the 3 months you used to have to wait pre-2017 (the LSAT was only given 4 times per year). The GRE, like the GMAT, is offered 365 days a year and can be retaken every two weeks an infinite number of times. Also, the GRE is by appointment so scheduling is much more flexible. The LSAT has 9 fixed days/times per year it will be offered. Overall, because of the stress associated with a somewhat rigid LSAT schedule, I'd say the LSAT format is more difficult. The GRE's flexibility makes studying easier. The LSAT critical reasoning blows the GRE CR out of the water. No contest. The LSAT is much tougher here. The questions are dense, the wrong answers are horribly tempting, and the timing pressure is unnerving. Again, it's a one punch knockout here for the LSAT. The LSAT reading comprehension can be absolutely bruising. Not that the GRE RC is a walk in the park but it seems like it compared to the LSAT. Like LSAT critical reasoning questions, LSAT RC q's can fog your brain and kill your score. We might have a draw here. If you're not a math person then you might find the GRE quant challenging. You need much more baseline knowledge to succeed on the GRE quant than the LSAT games. That said, the LSAT games logic can be quite challenging and in general the games require you to think more flexibly and creatively than the GRE quant which is a bit more content based. The LSAT no longer has an essay. Well, actually, it does, BUT it's a take-home-essay. So you or someone you know can knock it out within a year of taking your exam. Pretty nice huh? It seems LSAC is trying to shed that old, dusty, archaic, we're running around in white whigs (in the UK), vibe. At some point it's going to be: score your own LSAT. The essay's themselves are similar. GRE and LSAT essays do count for law school admission but less so than the rest of the score. And now that the LSAT essay is a homework assignment I can only assume it will be de-emphasized further. Do write some practice essays but essay prep should be secondary. Both the GRE and LSAT employ scaled scores and percentile scores. So you get a number that represents your absolute skill (scaled score) and then a percent representing how many people are above or below you (percentile score). The GRE sub-section scaled scoring is out of 170 which is confusingly similar to LSAT scoring which is out of 180. Why the GRE went its own way but also didn't really go its own way says a lot about the test itself. On the GRE there is no overall score. You only get subsection scoring. The LSAT is the opposite with no sub-section scoring (only an overall score). GRE to LSAT conversion is a mess. Why? The GRE has no overall score. The LSAT has no subsection scores. So it's very tough to compare GRE and LSAT scores. That said, ETS, makers of the LSAT have created a tool for LSAT conversion. Read the fine print and you find that conversion comes with a potential plus or minus 5 point error. That's a big swing. A 160 and a 170 are very different LSAT scores. That said, this conversion tool is what we've got and what admissions people are using to evaluate applicants for law school. Does a GRE score correlate with an LSAT score?According to a study by ETS: "The correlation between the GRE scores and the LSAT score is quite high at .85". We answered a similar question in the GMAT vs GRE and GMAT vs LSAT comparisons from a test preparation perspective. At the upper end of the scale: yes. If you're annihilating the LSAT then it's not unlikely you'll do the same on the GRE and vice versa. The nuances are different. The LSAT is more verbal and logic. The GRE is more content and a mix of verbal and quant. Still, if you have great reasoning skills and generally do well on standardized tests you'll likely do well on the GRE and the LSAT. If you don't have an amazing track record with standardized tests then the official particulars of the test itself may matter more. In that case there won't be as much LSAT, GRE correlation as the details of each test start to matter more. Here's where the LSAT is easier than the GRE: LSAT study materials are plentiful. There's an almost unlimited number of official practice questions to sharpen your reasoning skills to equal a fine Japanese chefs knife. GRE materials are scarce especially since the test has changed half a dozen times making older materials less helpful. If you are willing to commit your life to LSAT studying there's enough LSAT study material for a year of non-stop preparation. And, now that the LSAT has become the champion of test innovation, there's free Khan LSAT prep. Yes, you've read that correctly. LSAC and Khan have teamed up to do what Khan does best (well, not best, but he does it) provide free lesson videos. The GRE offers score choice which allows you to select exactly which scores you'd like to send to schools. (sigh of relief). Not so fast! Harvard law school says "we want to see everything from the past five years". 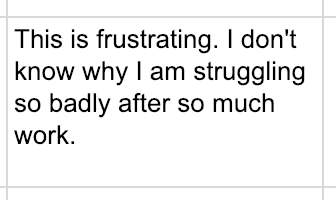 This is repeated about 5 times throughout their admissions FAQ. So, you can ping the GRE as many times as you like but beware that you are required to send all of those scores, duds and all, for consideration. And they claim that they do consider all of them. It's even recommended that if you believe one (or more) of the scores doesn't represent you in some that you provide an explanation. How will they know if you don't submit all of your scores? Who knows. I don't think they can find out. But, if they do, don't expect to be admitted and they could report you to whatever governing body there is. I'd send them all of the scores and be done with it. Something else to consider. If you've also taken the LSAT you must submit both your LSAT and your GRE scores. These guys are total control freaks. Makes sense that this is for law school. They want allllllll the evidence. Is the GRE or LSAT better for Law school? You just took an LSAT, panicked and failed, but need a better score for upcoming applications. The GRE may be your only option to polish up your application. Better a good GRE score than a crappy LSAT score. You're a quant whiz but not great at reading or critical reasoning. Why are you applying to law school?! Ok - moving on. In this case, it will likely be easier for you to get a much higher GRE score than LSAT score. You've been accused of a testing irregularity on the LSAT. GRE may be your only option. You're applying to other masters programs or a joint degree program. If you can get away with just taking one test then the GRE is a fantastic choice. Whereas there could be some bias towards LSAT for standard law school admission I doubt there is for the joint degree programs (part of the reason why GRE and GMAT have been brought into the law school fold). What about the GMAT for Law school? Here's our GMAT vs LSAT breakdown weighing the challenges presented by each test. With the GRE added to business schools and now the GRE and GMAT added to Law schools these are turbulent times in test prep. The motivations behind these decisions seem to point to money and power but the outcomes, I hope, will help give people options in what tests they can take for admissions and make the process easier. For admission to law school I'd still recommend the LSAT. It's tough to believe that a GRE score will be given exactly the same consideration at this point. The LSAT is the standard so I would stick with it. Also, even though it it the more challenging tense there are tons of study materials and helpful LSAT books to get you closer to your ideal Law program. If you're planning on a joint degree and both programs accept the GRE then go for the GRE without any regrets. I don't think a joint degree program would weigh one option as better than the other. Again, it seems that this is the big reason for the GRE (and GMAT) entering the law school market. What GRE score do I need for law school? That's unclear at this point. We don't have much information on the GRE scores of people admitted to law school. Should I take the GRE or LSAT for law school? Just for law school? The LSAT is the best choice but there are reasons why the GRE will be better for you. Do I have to submit all of my GRE scores? What about GRE Score Choice? GRE Score Choice is great. You can pick and choose what GRE scores you send to schools. However, some Law schools are requiring that you send all scores. So regardless of score choice, if you want to stay on the right side of things, you'll need to send all of your GRE scores. What law schools accept the GRE? Here's the list of law schools that accept the GRE.